You’re home from a long, exhausting day. All you want to do now is to sit down, have a nice dinner (alone or with your significant other) around candles, and relax. No lights. No TV. No phone or Netflix. But damn it, you don’t have any candles. You always say that you’ll buy them when you need them, but you always forget. 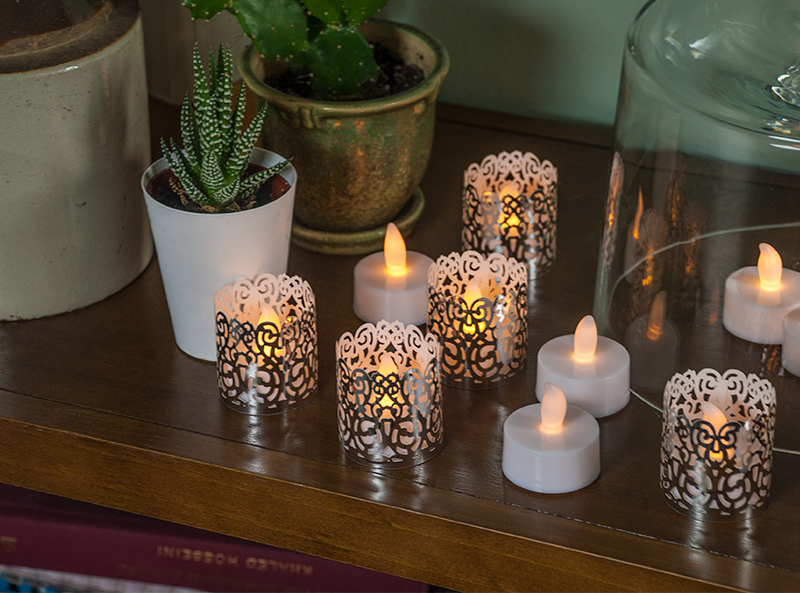 So for you, flameless tea lights are a perfect choice. They’ll give the same light and the same feeling like a real candle. 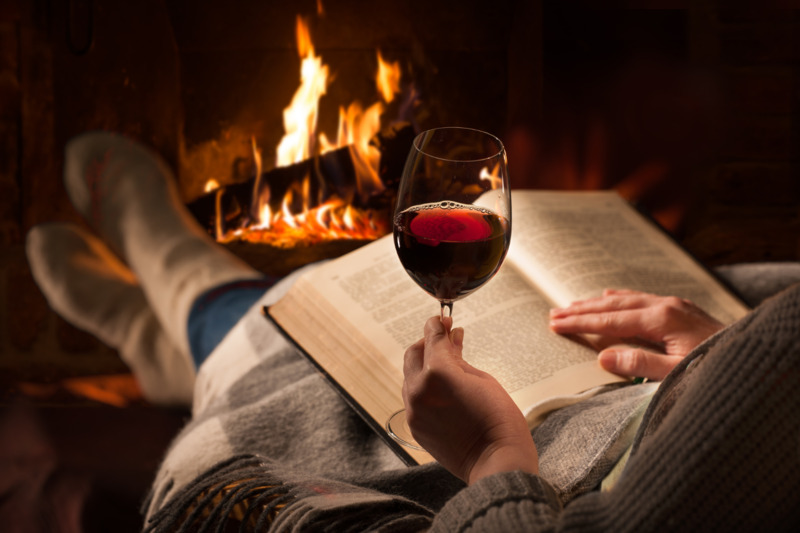 Since they work on batteries, you can be sure you’ll never have to postpone your quite, calm evening. And, very important, since this is not an open flame, you can feel free to fall asleep, not worrying if something will set on fire. 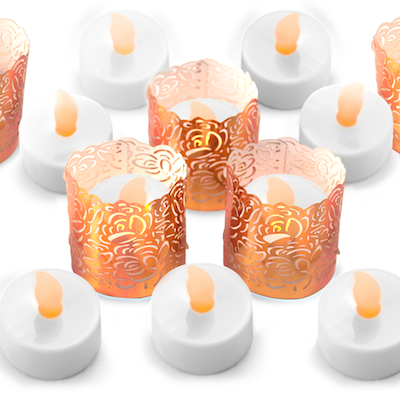 Flameless tea lights come in all shapes and sizes, and here I’d like to list my top 3 choices. If you’re looking for a realistic flameless tea light, with the realistically-looking “flame,” then this is for you. 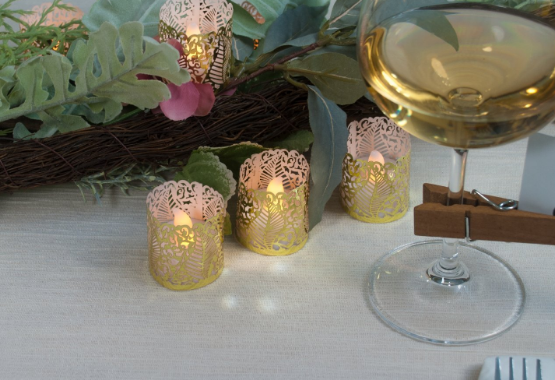 In addition to their realistic, stylish look, you also get these gold decorative votive wraps. 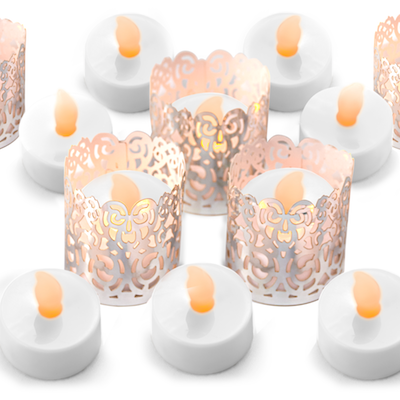 With them, these flameless tea lights get a certain dose of luxury and elegance. They’re perfect for your coffee table, but also a perfect choice for your dinner table when you want to wow your guests. They come in a package of 24 candles, 24 wraps, and 24 batteries that’ll last for about 80 hours. All that for just $15.97. 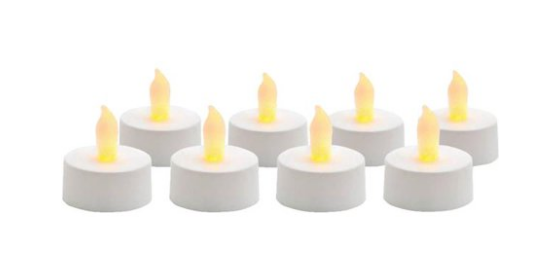 You can get these flameless tea lights on Amazon. They very minimalistic, stylish, and elegant. Their design is very similar to a real candle. What’s interesting about them is that they glow with a realistic flicker. Some people like it. Some don’t. But it comes down personal preference. Flameless White Tea Lights from Crate&Barrel come in a package of 6 for $12.95, which is a bit pricey, especially if you consider the main complaint from customers that these lights don’t last long. You can check them out on their website. 3. 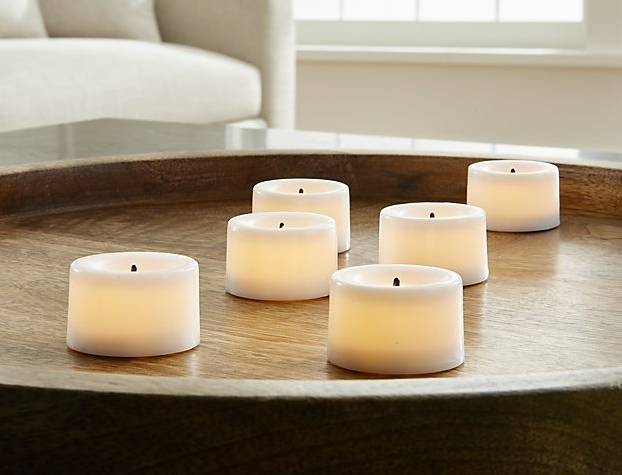 Flameless Tea Light, Set of 8 from Northern International Inc. In my honest, personal opinion, of all three presented, these flameless tea lights have the least visual appeal. But again, it all comes down to personal preferences. They’re elegant, with an interesting design, and give realistic light. You certainly won’t be embarrassed to put them on your coffee table in front of your friends. They come in a set of 8 for $22.04, which is pricier than the other two. You can get them at Walmart. Which one is your personal favorite and why? When lit, the patterned silhouettes create a unique candlelit environment. Each set includes a variety of styles. 24 included lithium batteries last longer than using traditional tea candles. These 80-hour batteries are economical and long-lasting, keeping your space illuminated and beautiful. Enjoy all the benefits of traditional candles and none of the negatives. Zero nasty smoke. Zero clean-up and most importantly, no dangerous exposed flames. 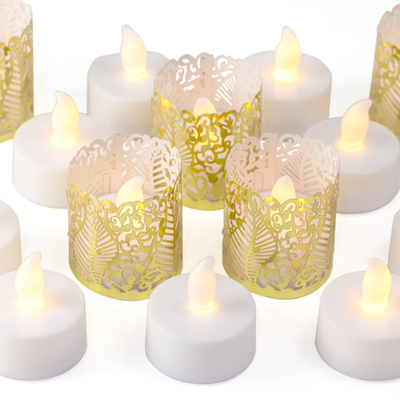 These tea lights are the safe, simple answer to decorate with light.